HMF’s latest generation of crane loaders in the 18 tm range has been developed and designed to solve many different lifting tasks. Advanced methods of calculation have been used when designing the crane’s components and geometry, to ensure that cranes offer a power-to-weight ratio amongst the best on the market. The HMF 1830-K Series is constructed as a strong and versatile working tool. The crane is available with up to 6 hydraulic extensions and 15° over-bending between the main boom and the jib, which provides high flexibility for demanding tasks in narrow places, e.g. through low gates and windows. The crane is equipped with a link arm on the jib, which provides high lifting capacity, even when the boom system is fully extended. The crane is suitable for fast grab work and for loading and unloading tasks at a low height far away from the vehicle. The 1830-K Series is equipped with a user-friendly speed control, which at the same time provides an increased lifting capacity. This system is activated when the load moment of the crane approaches its maximum capacity and therefore optimizes the operator’s ability to finely adjust the movements of the crane. 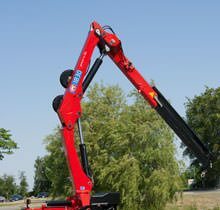 Whether the requirement is fast grab work or lifting at long reach, the HMF 1830-K Series is the right crane. As a part of a wide range of product enhancing optional extras for the HMF 1830-K Series, both winch and extra valves led in either hose guides or hose reels can be specified.